Derived from a popular Chinese folktale Butterfly Lovers (梁山伯与祝英台) regarded as the equivalent of Romeo and Juliet, the painted figures in traditional costumes are placed in a contemporary urban setting. The augmented reality installation addresses issues of Chinese diaspora and cultural identity, and visualizes the restless, roaming cultural spirit of the East hidden in western metropolis. 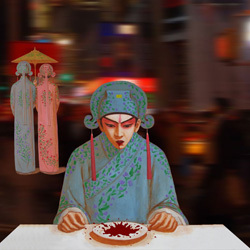 Integrating painting and mobile phone augmented reality application, artists weave storytelling of Chinese folklore into a contemporary, global circumstance. Butterfly Lovers superimposes two layers of reality that are contradictory yet interpenetrating: while the augmentation Butterfly Lovers symbolizes perpetual repression of humanity and resistance in Chinese culture, the actual night scene of a western urban district becomes an emblem of consumerism. As Chinese immigrant artists, we have witnessed many tragic stories of the diaspora. Although being surrounded by urban crowds and dazzling material world, immigrants often live in isolation and struggle to survive. Our own life experience and the fate of our friends urge us to expose the situation through artworks. What is the real relationship between cultural spirit and material reality? This is the question raised by Butterfly Lovers. As a new media artist collective, Lily & Honglei (Xiying Yang, Honglei Li) work in both New York and Beijing China. Their projects utilize traditional painting techniques and digital imaging technologies including animation, virtual reality, and augmented reality on mobile phones, which construct an in-between space reflecting Chinese cultural heritages and current social issues in the context of globalization. Lily & Honglei both studied fine arts in China and continued their education in art in the States. Lily Xiying Yang received a Master of Fine Arts degree in Digital Media from College of Visual and Performing Arts at University of Massachusetts, while Honglei Li earned his MFA degree in Painting from the University of Massachusetts, Dartmouth. Lily & Honglei have exhibited art projects internationally, with solo exhibitions in Germany, China, Australia and United States. As members of Manifest.AR, they have participated in a series of augmented reality art exhibitions including Bushwick Augmented Reality Intervention at Nurture Art Gallery in New York, Gradually Melt the Sky at Devotion Gallery in Brooklyn New York, Boston CyberArt Festival at Institute of Contemporary Art in Massachusetts, among others.